Connectria Hosting Review 2019: Is Connectria Hosting a Good Hosting? Connectria Hosting is a world-class partner provider of enterprise-level hosting, IaaS, and SaaS services. They have a huge variety of solutions based on different technologies such as AWS, Azure, and Office 365, and they operate from world-class data centers including a Tier 4 data center. Since their very beginning in 1998, Connectria Hosting has been providing complex custom solutions to massive multi-national corporations such as banks. They now have more than 1,000 such customers – including Deutsche Bank, IBM, Sybase, and TIE Commerce – in more than 30 countries. Data centers are located in St. Louis, Philadelphia, and Dallas. Connectria relies on the core principles of reliability, security, flexibility, and integrity. Their No Jerks Allowed philosophy means that every employee of Connectria Hosting should go above and beyond the call of duty to give their customers a great hosting experience. It’s hard to know even where to begin to describe Connectria’s hosting solutions, features, and services. If you need enterprise hosting solutions that integrate with or make use of the top server, hosting, or infrastructure-as-a-service platforms, then Connectria Hosting can probably help you. They offer everything you can think of including Health Insurance Portability and Accountability Act (HIPAA) compliant hosting, their home-grown ‘TRIA’ set of connected services for AWS, SaaS application hosting, and just about any other web or business application. Connectria can spin up solutions using any OS: Linux, Windows, Unix, Solaris or even IBM i. Their database technologies include (but are not limited to) MySQL, SQL Server, Oracle, and DB2. Some of the popular web hosting applications for which they specialize in creating solutions include Citrix, VMWare, Exchange/Outlook, SharePoint, ASP.Net, and WebLogic. All Connectria servers are housed in world-class data centers, the pinnacle of which is the Tier 4 CyrusOne data center in Dallas, Texas. All their data centers have successfully completed SOC 1 Type II audits in compliance with SSAE 18 Auditing Standards. It’s hard to form an overall opinion about Connectria’s pricing because they don’t have any pricing plans or packages for most of their products. With the exception of Microsoft 365 hosting, all their solutions are custom-quoted according to the individual customer’s needs, which makes them very difficult to compare. Connectria’s support is just as segmented and specialized as their solutions. They offer a number of SLAs with different levels of support and managed services. Each solution also comes with the technical support services appropriate to that platform in terms of security, monitoring, performance enhancements, backup and restore services. You can also reach them via a number of channels including telephone, email, a ticketing system, and live chat. For anything that falls within the category of business solutions involving any type of hosting infrastructure in the cloud or on dedicated servers, you can bet that Connectria Hosting has something that fits the bill. The best way to find out what they can do for your business is to contact them for a custom quote. 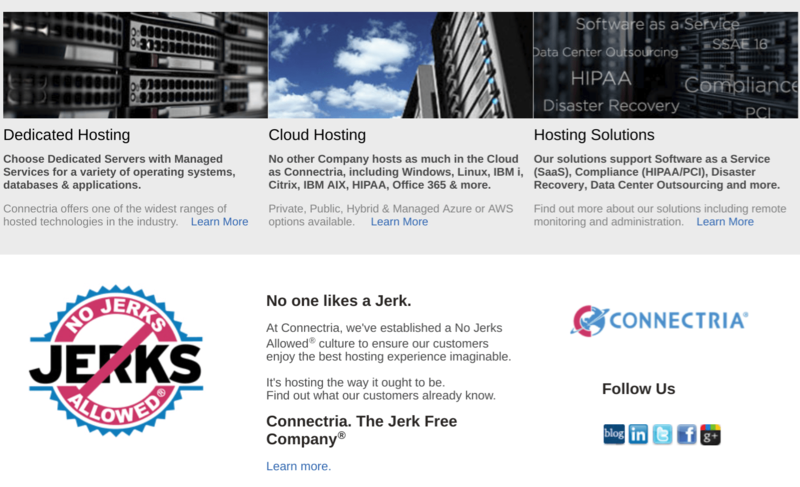 Wondering how Connectria Hosting stacks up against other Web Hosting companies? Enter any other Web Hosting company and we will give you a side-by-side comparison.